How many folks were on the tour? Please, Jeremy, can you edit the caption for the above picture to identify the visitors and their affiliations? Second from right I see 'ol-faithful, the legendary Roger Ingram. Next is stalwart Dustin Flavell, then the almost legendary Gary Childers (I think). I do not recognize the remaining four. And, how many folks in total showed up for this tour? I am responding on Jeremy's behalf. The photo has been updated with a caption listing the participants of the tour last week. 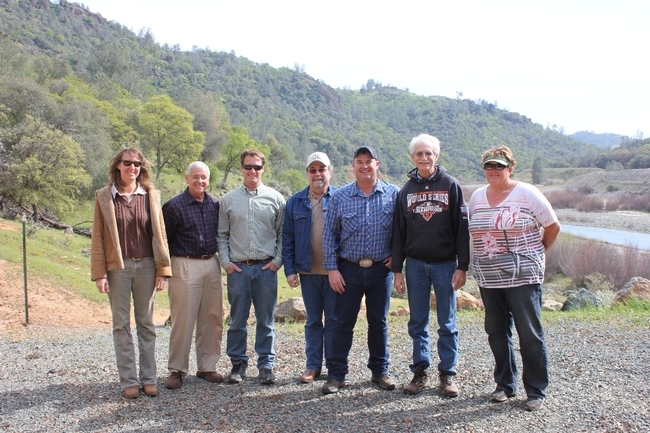 This was a small tour organized for some of Nevada County's key officials and ag industry representatives in order to highlight activities at SFREC and encourage dialogue about potential outreach and education opportunities for the community. Thanks, Megan. I'm sure the visiting Nevada County key officials and ag industry folks appreciate being acknowledged. Not to mention residents in the local area and UC researchers who have Projects on the Station. You're on your toes, Megan! That information wasn't there an hour ago. It just struck me that all of the visitors were from Nevada County. Just wondering if, as rumor may put it, California may begin to combine pairs (or groups if appropriate) of counties of like physical characteristics, economic enterprises, and needs, in the interest of reducing administrative costs and confusion. This was once considered for Yuba and Sutter Counties, but integration of Yuba and Nevada Counties would seem to make more sense. Who knows -- they could become a new state! The two together would then "own" a good share of the Yuba River, which would open up some amazing opportunities to develop water-based recreation. That could bring in more income than "furry" beef cattle ever could. PS: Please say "Hi!" to Jeremy. I'm not sure where any of these rumors stand, but interesting thoughts for sure. Especially considering where the Yuba River is concerned. I will certainly tell Jeremy you say hello.